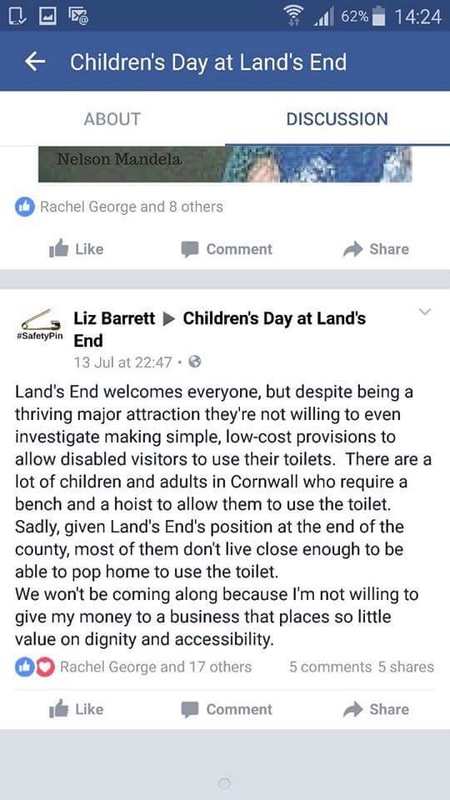 Lands End is not for everyone. We wanted to go. They even let us in! Unfortunately, we could not stay due to my nine year old son needing the toilet. My son has some extra needs to the rest of our family and the toilet facilities at Lands End were woefully inadequate. I explained the difficulties we had encountered and informed them of what would help. I did not expect them to just get it done immediately but I did expect some interest, a little compassion and a request for more information. Perhaps a suggestion that they were keen to try to improve. Perhaps even that they were sad that a child was let down. I have had a generally positive response from other local attractions with several saying that they had been unaware of the needs of so many but, now that they know, they want to improve. 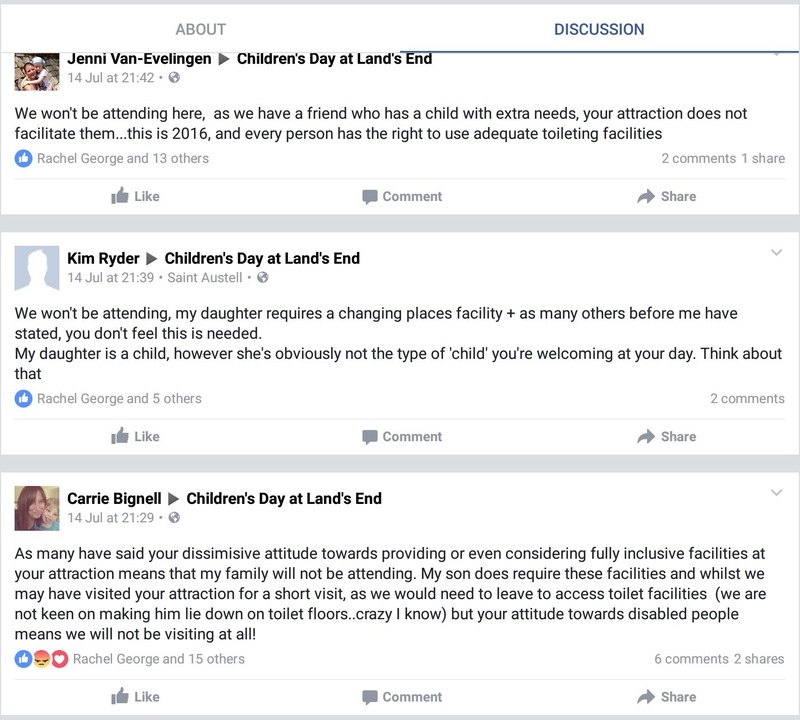 One local attraction, Camel Creek (previously Crealy Cornwall), came to me without being directly asked to do anything. When they discovered that there were many people in Cornwall (and a huge number of potential holiday visitors) who need extra equipment to enable them to visit they asked about it. This is really the kind of response every tourist attraction should have. After all, shouldn’t every business be constantly striving to improve? 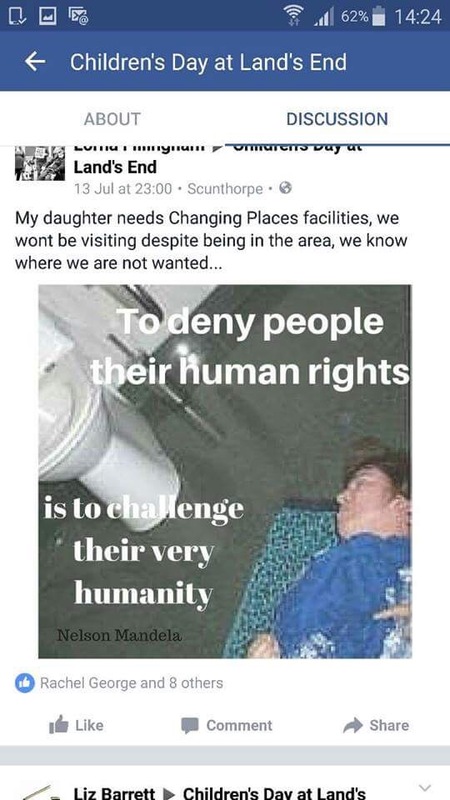 Surely, when you discover that people are indirectly discriminated against due to be unable to access your toilets, you would just WANT to change it? Lands End did not feel that way at all. In fact, they tried to suggest that it was simply impossible to improve due to the “remote landscape” and “limited internal space” and even pointed out that their current disabling toilet is only 1.04m wide at one point and at its widest is just 1.42m. Hardly suitable for many disabled people really! Many powered wheelchairs would not be able to turn around in there. People don’t really want to close the toilet door before going do they? Then they suggested that they hoped that this would not deter us from visiting again! Really? Would not being able to use the toilet not deter most people from driving to the end of the country? The Land End website doesn’t sound like it is so remote that you can’t even pee there! “We may be biased, but we think the outdoor spaces and places in West Cornwall are the best in the country. From amazing coastlines to glorious countryside, there are hundreds of activities to enjoy, from energetic pursuits such as surfing, swimming, cycling or walking, to more passive activities such as bird watching, photography, painting, fishing or simply admiring the wonderful views. The full exchange is available to view on What do you Think? I chose not to name them as I fully believed that they simply hadn’t understood the need for this equipment. Many people left messages on that blog so I contacted the PR department at Lands End and asked the to take a moment to read it. To read what they had said to me and the comments from others. I really hoped that they would think about it. They replied quite swiftly but sadly it was possibly even worse than before. “I am sorry to hear that you feel our response was unacceptable. Please do not be mistaken, we absolutely empathise with Adam’s situation; although, I must echo the sentiments in my previous email. As I stated in When someone just doesn’t care, I really don’t think I am being “mistaken” here. My son is just a boy, he doesn’t have a “situation” he just needs an adapted toilet, like hundreds of thousands of others. I still had hope, though. I still want to believe that people are inherently kind hearted. 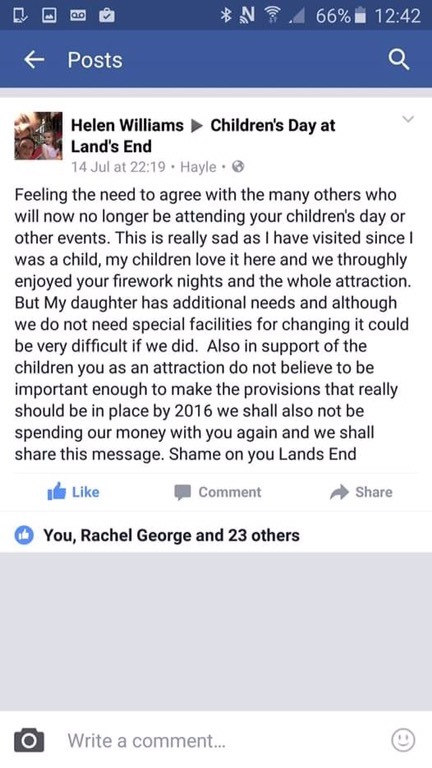 Last night (Thursday 14th July) I was directed to view an event page of the Lands End Landmark Facebook page and I was touched to see so many comments from people saying that they would not be attending their Children’s Day event due to the poor response given to a mum who asked them to improve their toilet facilities. Some were people who know Adam but many more were from people who had just read what had happened and were horrified at the responses. My faith in people was high. 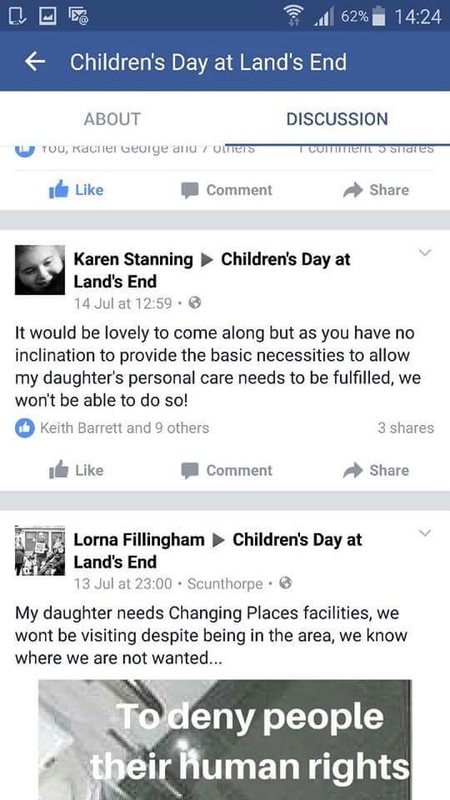 I was hoping for a response from Lands Ends, maybe thanking people for bringing the importance of these facilities to their attention or even saying that they would look into it, but no, all they did was delete every single comment and ignore the issue. Deleted them like they had never existed. Hid those words so that they were invisible. 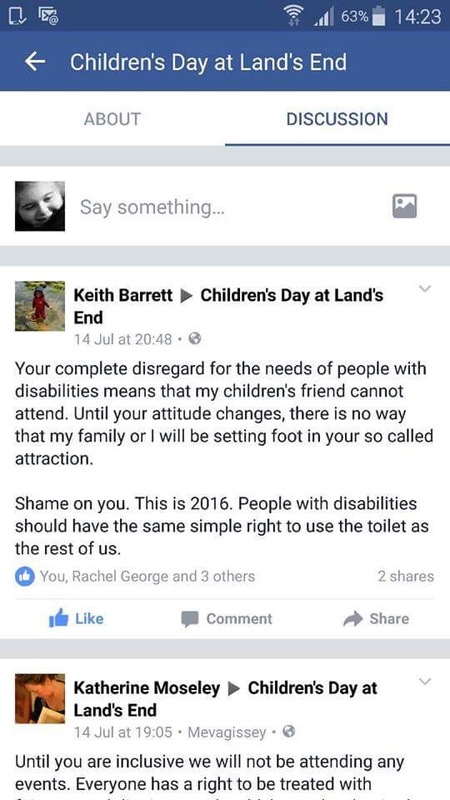 Like disabled people are to them. Thankfully, the magic of technology means that most of those comments could be tracked down after deletion. 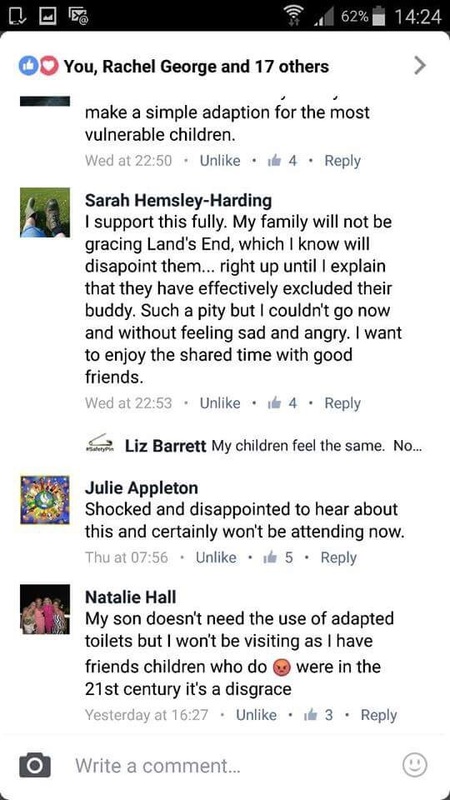 I don’t personally know how but many good people have sent me screen shots of the comments Lands End wanted to hide. I hope you will agree that these people were not rude, the language used was polite and these voices deserve to be heard. Lands End, I am beyond disappointed in your lack of humanity. 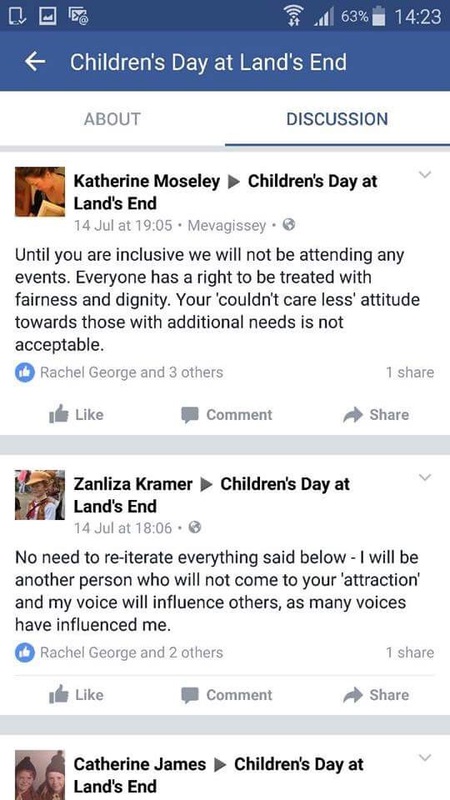 Yet I still have hope that this awful response is merely down to a poor PR person and that somebody is going to realise that allowing discrimination to continue is simply not okay. 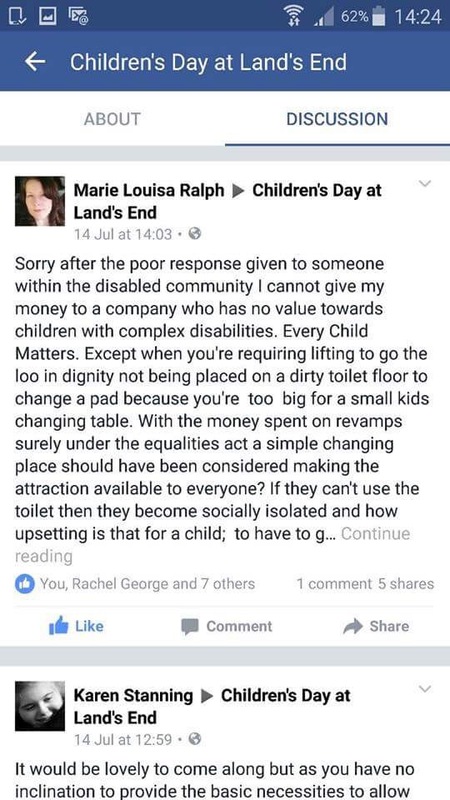 No, it wasn’t just a PR shambles, the management at Lands End understand that by not changing their toilet facilities they are excluding some disabled people. But they are not changing them. 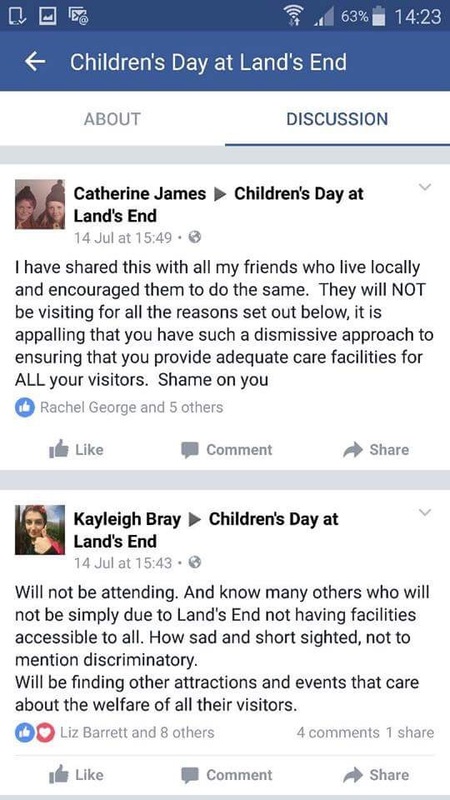 We are NOT WELCOME AT LANDS END. Previous: Previous post: Just stop! Have you copied No Go Britain? I’m sure Dan would be interested! A friend shared this on Facebook and I’ve just read it. 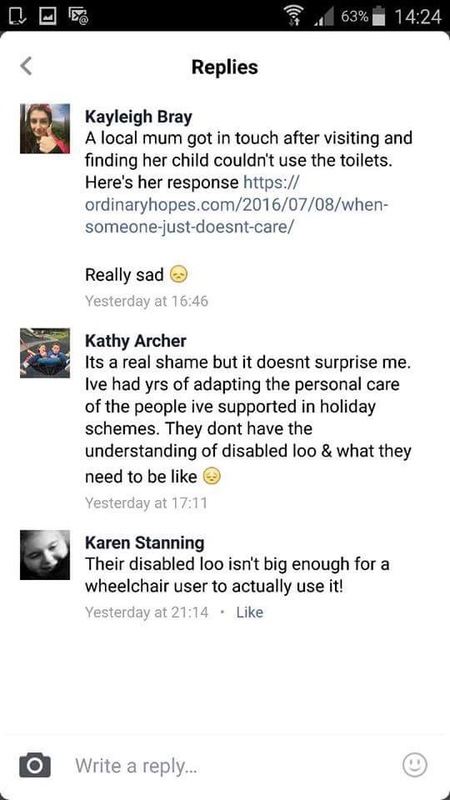 Utterly reprehensible behaviour towards disabled people, though am I surprised? Not really. So many people think that those of us with disablities are simply beneath them, that we are the lowest of the low and are easy to trample on because we can’t fight back. However, I’d like to suggest a solution here. 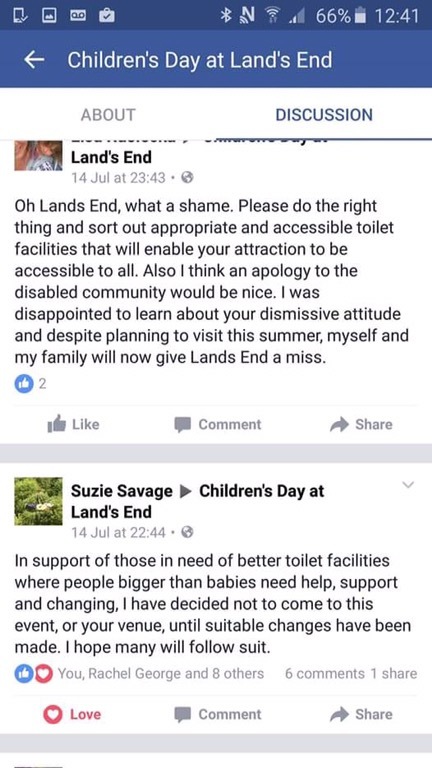 I’m happy to travel down from London to get together with as many disabled people as we can muster, travel to Lands End and use whatever serves as their tourist information centre as our bathroom. Let’s pee everywhere! Ok, so I may be joking (I’m not, I would totally do this) but I really do feel for your family. I’ll share this and hopefully they’ll be forced to do something. Hopefully. You did make me giggle there! Another friend has suggested we pop down and carry poo bags in view! I live locally and used to visit Lands End 2 or 3 times a year with my sons. 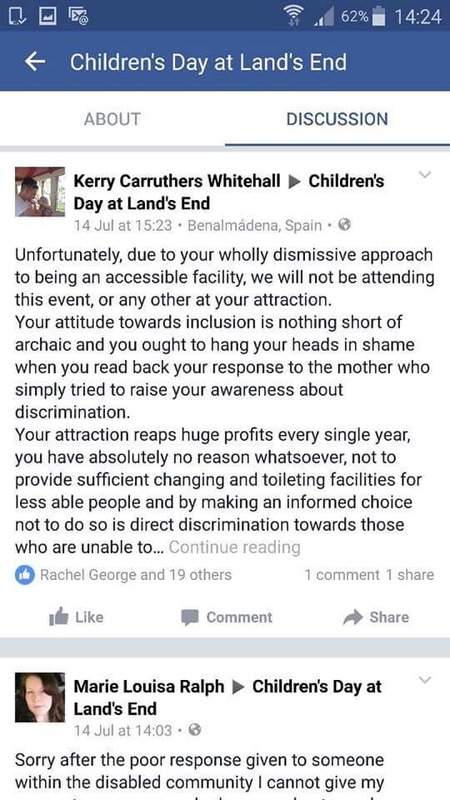 However, I will not be visiting there again due to their total disregard and disrespect towards disabled people. In this day & age it’s not much to ask that everybody should have access to toilet and changing facilities. 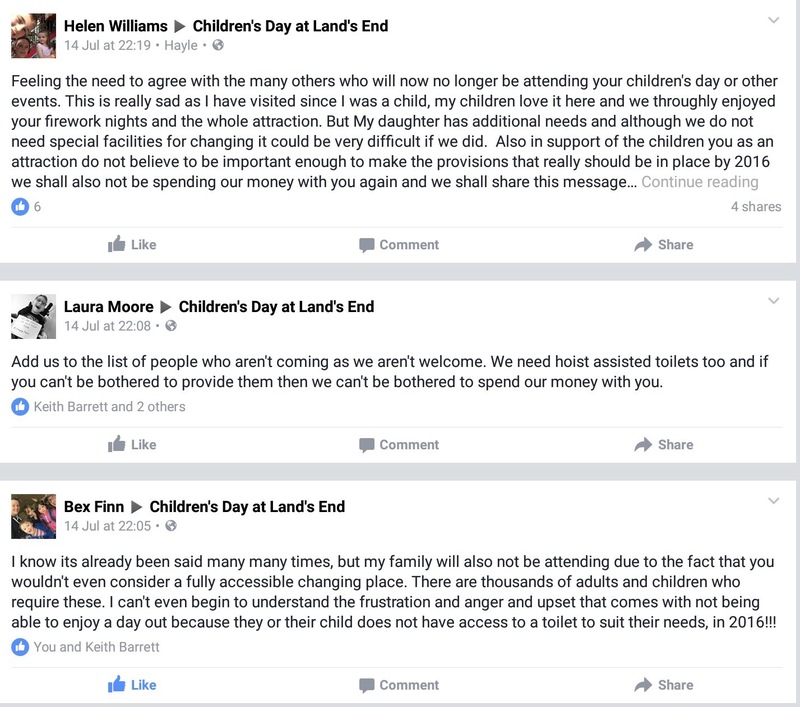 Hall for Cornwall have listened and agreed to install an accessible changing place, Lands End need to follow suit! The PR department did not even ask any questions. Even knowing that we visited but could not stay. A complete lack of will to improve. Yet I have had a small animal charity get in contact to ask how they can be more accessible. An organisation which does not make profits wants to help. That speaks volumes and makes Land End seem even worse. 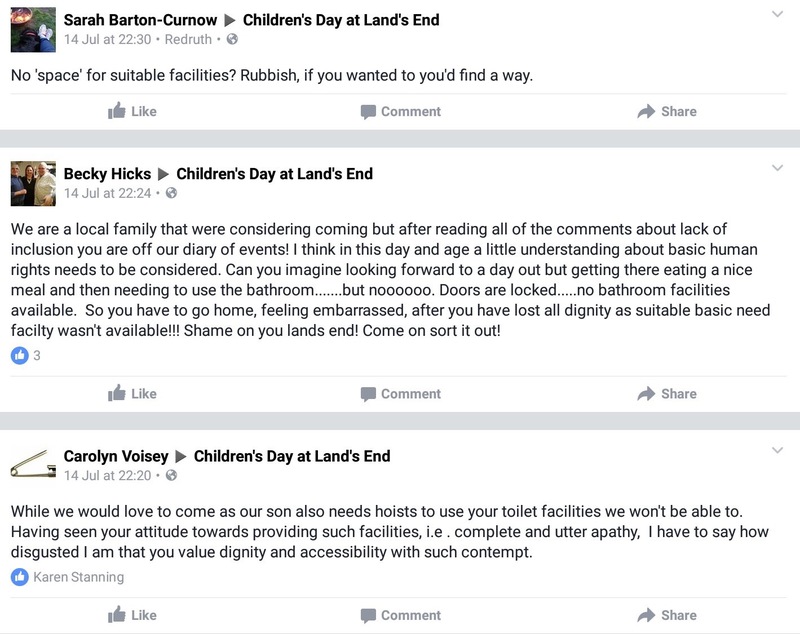 Lands End are now vetting all posts on the Facebook event page. I tried to re-post your article but doubt it will be accepted. Deleting the comments and refusing to give people a voice sits neatly alongside their refusal to even consider how they might improve. I am at a loss to understand how a tourist attraction can be so lacking in interest when told that they are missing out on a huge market of potential visitors. Surely it makes good business sense? Oh. My. God. Seriously? They deleted all the messages? So ridiculous and immature and for a PR team they clearly they have no clue about social media. For the record, I am also up for the pee-in suggested above!! Hee hee. Got to bring a bit of humour to a totally ridiculous situation. The response has been unbelievably awful. They get a little bit worse each day. I don’t want to be a bringer of legal action but I have a feeling it will come to that. I hope that the penalty for discrimination far exceeds the cost of the correct facilities. Plus the fact that they will still have to comply. Be good to read the story in the national newspapers, can’t believe anyone will condone their actions (lack of). Offering solidarity and thanks for highlighting this issue. I have a powerchair, one of the smallest midwheel drives on the market. Given the dimensions you shared I doubt there would be room for me to safely transfer to the toilet. It’s mindblowing how some businesses just don’t understand the needs of a large proportion of their customer base. Yet they would hope that that would not deter you from visiting! I have contacted the owners now. Hoping they care more than the management team do. 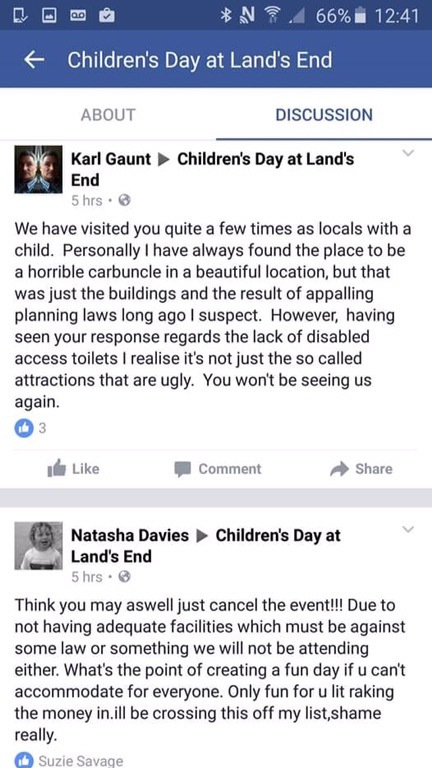 Well as a powerchair user who’s prone to bladder infections, I think that would definitely deter me from visiting!